Welcome to Bubble Company. We build all types of fun& safe inflatables for kids play and adults sport games, great for commercial rental business and amusement parks. A: 0.55mm PVC vinyl, 1000D durable laminated cloth, high strength, lead free, water proof, fire retardant and UV protective to withstand up to 120 degrees in temperature. Besides, we use slippy slide sheets, high quality interior baffle materials and durable nylon threads. Q: How do you do reinforcements to ensure high quality? A: We use professional commercial sewing machines, with strong threads to double stitch everywhere, quadruple or sextuple stitch for sensitive areas, reinforced strips at joints.We also use professional welding machines, high-frequency machines, automatic cutting machines and digital printing machines to ensure strength, durability and longevity. Q: What standards/certificates do you pass? A: CE, SGS, EN71, ASTM-6413-99, NFPA 701 (1999) Large Scale, FTMS 191A Method 5903 and Australian AS3533.4.1. Q: Can add logo printing? A: Yes. This is for free unless printing area is big or logo is customized and complicated. You may send us high resolution artwork in JPG, PDF or PSD. Q: What can we add for Inflatable Games? 1). Logo printings --- You can send us high resolution artwork in JPG, PDF or PSD. 3). Entrance ramp --- Most designs already include. 4). 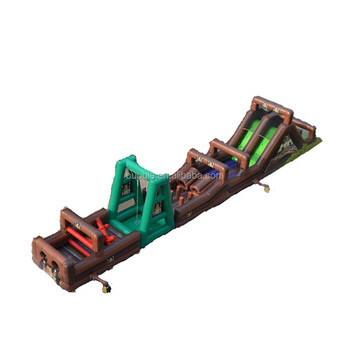 Bounce, climb, slide, pool, tunnel, basketball or obstacle functions --- Most designs already include. 5). Rain/Sun roof cover --- Some designs already include. Q: What kind of mesh/nettings do you use? A: Small hole mesh/nettings which children's finger cannot put through, soft, comfortable, safe and durable. Q: How to blow up Inflatable Games? A: By electric air blowers which are included, we can match suitable power and plugs for you. It usually takes 5 minutes to blow up depending on design. Please make sure blower air hoses and hook&loop zipper openings (for quick deflaton) are closed when in use. Q: How many air blower hoses on an Inflatable Game? A: Usually 2 air hoses (1.2m long, with safety flaps inside) on the back base of bouncer, with good looking hook&loop covers to hide. Q: Can we use in winds? A: Although we make anchoring tie-down D rings (usually 4 to 15 rings for every ground corner and higher points, depending on design) for stability, please use it depending on actual scene, we do not recommend use in strong winds more than 35Km/h. Q: Can we use in rain? A: We do not recommend especially for heavy rain. A: Yes. 3 years' warranty against material defect and workmanship. It's long distance to ship back, so we send repair kit for every inflatable product. If it is damaged, you can use repair kit (glue and same color material) to repair, and we are happy to guide you through if there's any problem. Q: Prices and Selling Terms? A: 1) Unless otherwise stated all prices listed are including air blowers and repair kits, and based on Exworks selling terms. 2) We can do CNF/CFR, CIF or DDU terms if you need. 3) We recommend bigger quantity orders or wholesales which can save production and order processing cost, so as to get a discount. A: We accept payment by T/T (bank wire transfer), Western Union, Money Gram, Pay.pal, Secure Payment or Trade Assurance. 30% deposit, balance after production (we will take pictures or videos for confirmation). 2. Material: 0.55mm PVC vinyl, 1000D durable laminated cloth, lead free, water proof& fire retardant and UV protective.High quality slippy slide sheets, interior baffle materials and durable nylon threads. 3. Professional Automatic Cutting Machines, Commercial Sewing Machines, Welding and High-Frequency Machines and High Resolution Digital Printing Machines to ensure high quality. 5. All these designs are made in constant air blown style with blower working all the time. Air leakage from the product is normal, this is to prevent over-inflation while under constact airflow. 6. Reinforced strips at joints, double stitching everywhere, quadruple or sextuple stitch for sensitive areas. 7. Safe Anchoring D Ring Fixtures, Safe& Convenient Air Flap with Durable Zippers, Safe small hole netting/mesh windows. 8. Price includes air blower (CE 220v-240v or UL 110v-120v with various kinds of plugs) and repair kit. 10. Packing: Strong packing bag and export carton for transport. 12. Payment: 30% deposit, by T/T (telegraphic bank transfer), Western Union, Money Gram, Pay.pal, Secure Payment, Trade Assurance.